"A priceless gem, set in a silver sea." like Lochleven Castle. But Bothwell Castle presents none of these characteristics. The scenery which surrounds it is essentially woodland and pastoral, and the quiet which reigns in the vicinity seems somewhat out of keeping with the massive towers and buttresses, which speak of inharmonious war in the midst of peaceful repose. The Clyde, flowing around the domain of Bothwell, forms here a winding link, and wanders placidly betwixt verdant banks crowned with varied foliage. From one point of view the source and exit of the water are alike invisible, and the overhanging boughs of the trees on either side of the river, as they seem to meet, delude the spectator into the notion that he sees before him a still, inland loch forming a natural moat for the Castle rather than a mighty river pouring its resistless flood onwards to the ocean. From, the margin of the river the banks rise in gentle slopes on either side, showing patches of greenest verdure through the over-arching leaves of beech, of birch, and of elm which fringe the water-edge and crown the grassy summits of the confronting eminences. On the left bank of the river the ruins of Blantyre Priory may be seen rising from the grey rock on which it was founded about the beginning of the fourteenth century; while the grassy mound on the right bank is surmounted by the remains of Bothwell Castle, whose ivy-mantled walls have looked forth upon many changing epochs of Scottish history, and whose halls have been trodden by both the friends and foes of Scotland. The ruins of Bothwell Castle have been regarded by antiquaries as affording one of the finest examples of its style of architecture in the kingdom. The date of its erection is not accurately known, although it was certainly in existence early in the thirteenth century. The plan of the Castle, as well as the method of masonry employed, distinctly show that it was not the work of native artizans; for in those times Scottish architecture was of the rudest description. Possibly some enterprising Southern knight had penetrated into the remote recesses of Clydesdale, and, enamoured of the locality, had annexed it to his property, and built the Norman Castle thereon. The size of the building itself would forbid the idea of its having originated with any of the Scottish nobles of that distant time; for there were few indeed among them wealthy enough to have undertaken this task, even had they been civilized enough to conceive it. But as no authentic record exists of the original builders, all is but conjecture. The social position of its first occupant may be imagined from the idea of its magnificence which the ruins still convey. It has been constructed as an oblong quadrangle, with inner court enclosed by vaulted buildings, probably with circular towers at the corners, of which the greater part of two remain, although but slight traces of the others now appear. An examination of the existing ruins will show that the Castle covered an area of about 240 feet in length, by 100 feet in breadth. The lateral extensions between the towers are pierced irregularly with windows, but there are not sufficient examples left to enable us to decide as to the nature and extent of the chambers these walls contained. That it was devised as a stronghold is evidenced by the strength of the outer wall, which is about 15 feet in thickness, and stands nearly 60 feet high. Despite the almost defenceless position which it occupies topographically, it is evident that no light force would be necessary to win the Castle from resolute defenders. Yet there are few Castles on Scottish ground which have more frequently changed masters, and though we cannot tell whose brain devised or whose hands upreared its towers, the stories which are known of its chequered career link its history with that of Scotland; and the Barons of Bothwell in chivalrous times for a long period exercised vast power both in the Council and the camp of the nation. Most of the structures of a similar kind, even if they have not their beginning recorded, have at least accurate details of their destruction; but the date of the erection of Bothwell Castle is unknown, and the name of its destroyer can only be conjectured. The first name associated with a Castle of some kind at Bothwell is that of Olyfard, and the connection of the family with Scotland may be traced. The family were of long Norman descent, and the name appears in "Scalacronica" amongst the Norman knights who fought on the side of William I. at the battle of Hastings in 1066, and received grants of land in Northamptonshire from the Conqueror. In 1113, when David I. of Scotland, sixth son of Malcolm Caeamor, when Prince, became Earl of Northampton by marriage he came much in contact with the Olyfards, and was godfather to the heir, David Olyfard. This fortunate youth, though on the English side, was able to assist David’s escape after the Battle of Winchester in 1141, and he accompanied the fugitive King to Scotland, and became a prominent member of the Scottish Court, and received many grants of lands from his godfather, the King, becoming a generous benefactor to the Church. Though Bothwell is not specially mentioned, it is evident that he had a seat there, as he gave a contribution from Bothwell towards Blantyre Priory, the ruins of which are close beside the ruined Castle. David Olyfard was made Justiciary of Laudonio, which included the lands south of the Forth and on to the Tweed. He was one of the first to establish feudalism in Scotland. Walter Olyfard, the third Justiciary by heredity, died in 1242, and though there is no known clue as to the style and extent of Bothwell Castle in his time, it must have been a place of importance as the regular seat of the Justiciary of the South of Scotland. The statement has been made, and not disputed, that the daughter of Walter Olyfard was married to Walter de Moravia, who was ancestor of the Randolphs, Earls of Moray, and thus a new race came into possession of Bothwell Castle and the surrounding district. In the time of Alexander II. the influence of England in the government of the northern part of the kingdom had been experienced, and the unfortunate imprisonment of William the Lion, the King’s father, had suffered the English to have some claim to feudal superiority. The boldness of Alexander had prompted him to oppose their efforts, and to seek to undermine the power of the throne of England by joining with the Barons against King John. That monarch, enraged at this presumption upon the part of his vassal, gathered together an army of freebooters and desperadoes, invaded Scotland, crossing the Humber, and laying waste the provinces between that river and the Forth. The Scottish King was unable to oppose his march, and presently retired until an accession of forces should join him. Then, ordering the Castles of the knights who had joined him to be left in a defensive position, he pursued King John by way of Berwick and chased him ignominiously to his own country. At this time Bothwell Castle was in the possession of Walter Olyfard, and would doubtless be considered a post of importance, as it lay in the midst of a fruitful country, and was sufficiently apart from the highway of England to escape the destruction with which the invading armies usually overwhelmed their adversaries’ dwellings. It was not to be expected that a position of such strength as Bothwell must have been would long escape the notice of the English. The armies which overran this portion of the kingdom ere long discovered that the district of Clydesdale could remain unsubdued whilst Bothwell and Dumbarton were in the hands of the natives. Against the former of these, therefore, they directed their endeavours, and with too fatal success. The delusive hopes which the Scottish statesmen had built upon the apparent amity that existed for some years betwixt Henry III. of England and his son-in-law, Alexander III., had been rudely shattered by the attitude which the former assumed upon the question of the independence of Scotland. But Henry was too polite to risk an open rupture with Alexander, and proceeded therefore by underhand means to secure the division of the kingdom though fomenting discord while professing friendship. His schemes were interrupted by the hand of Death; but he bequeathed his policy to an able successor in the person of his son and successor, Edward I. How faithfully that monarch fulfilled the desires of his much-lamented father need not here be told except incidentally. Every one knows that Edward endeavoured to entrap his brother-in-law, Alexander III., into rendering homage for the kingdom of Scotland; that he took advantage of every pretext for interfering in Scottish affairs during his life; that he expired in the very act of leading an overwhelming army against the defenders of her liberty; and that he directed that his tombstone should bear as its proudest motto the self-assumed title of "Malleus Scottorum"—"The Hammer of the Scots." It is not, therefore, necessary to dwell on all the details of this King’s venturous career. When he visited Bothwell Castle in 1301 it was a very different place from that which the Olyfards had left about fifty years before. Sir Walter de Moravia had vast means at his command, and had determined to erect a Castle worthy of the superb position. His wife, the last of the Olyfards in Lanarkshire—the family were afterwards located at Newtyle, Kinpurnie, and Gask in Perthshire—was at the Scottish Court, and had met the second wife of Alexander II., the famous Marie de Coucy of Picardy, who was married to the King in May, 1239, at Roxburgh. Now, in 1230, the Queen’s father, Enguerand III., Baron de Coucy, had just completed the splendid Chateau de Coucy, in Picardy, which evidently has been the model for the Bothwell Castle, possibly planned by Walter Olyfard, but certainly completed by Walter de Moravia, no doubt with the prompting of his wife, who may have sought to rival the Queen. It has been shrewdly suggested that Queen Marie may have brought to Scotland some of the Mason Lodges that had been engaged on the Chateau de Coucy, and that these may have been employed on the building of Blantyre Priory and Bothwell Castle. The theory is by no means incredible, and accounts for the similarity of the plans of Chateau and Castle. In any case it seems to be fairly confirmed that Bothwell Castle was finished in a splendid fashion in 1278 or thereby. The second Walter de Moravia was married to a sister of John Comyn, one of the competitors for the Scottish Crown; and he had two sons, William, who swore fealty to Edward I. in 1291, and Andrew, the famous patriot, who supported Wallace, and fell in September 1297 at the Battle of Stirling. His son, Thomas Randolph, whose mother, Isabella, was a sister of King Robert the Bruce, was also such a conspicuous hero in the War of Independence that Robert I. conferred upon him the Earldom of Moray, and after the King’s death he was Guardian of Scotland. Bothwell Castle was still the seat of the Earl, though in 1299 it had been captured by the English. The place was visited in 1301 by Edward I., who resided there for three days, and then placed Bothwell in the charge of the English warrior, Aymer de Valence, Earl of Pembroke, who was appointed Governor; and there is a consistent tradition that the plan for the capture of Wallace was devised at Bothwell. Was holden as a place of wer." Their attempt to withstand the victorious Scottish army, however, was hopeless, and they were forced to abandon the Castle. At a later date the first Earl of Moray had the strange task allotted to him to dismantle his own Bothwell Castle and also the Castles of Leuchars and St Andrews, to prevent them from being again occupied by the English. 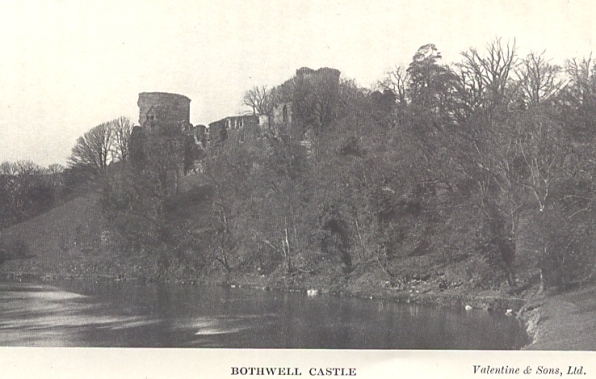 The demolition was afterwards repaired by the next noble family that came into possession of Bothwell Castle, though traces may still be found of this incident. Similarity of patriotic feelings as well as pursuits had long held the families of Bothwell and Douglas together. They claimed a common origin from some of the Flemish families which had settled in Scotland at an early period, and their determined resistance to the encroachments of England had saved the country from conquest on several occasions. When, therefore, the race of the first Randolph, Earl of Moray, terminated by the death of John, his grandson, third Earl, who was killed at the Battle of Durham in 1346, leaving no male issue, his brother, Thomas, who does not seem to have assumed the title, died, leaving a daughter, it was not unnatural that a union of these two families should be brought about by marriage. And thus it happened that by the wedding of Archibald "the Grim," Earl of Douglas (though an illegitimate son), with the heiress of Bothwell in 1381, the Castle came into the possession of this powerful family. Marjorie, the daughter of this marriage, was united in wedlock to the unfortunate Duke of Rothesay, son of Robert III., at the Parish Kirk of Bothwell in 1398, and though no record exists to warrant the conclusion, there is every probability that the marriage festivities took place at the Castle. For nearly a hundred years the Douglas Earls held the Castle, and the strange manner in which they came to lose it is worthy of notice. Without accepting wholly the fanciful tales which Hume of Godscroft relates as to the origin of the Douglas family, it must be admitted that they can claim a very respectable antiquity. Their historian maintains that they were almost the only family of note that could trace back their ancestry to a purely Scottish source, but his theory will hardly bear critical investigation; and the notion that their progenitor was a man of mark "in the days of Solvathius, about the year 767," will scarcely receive credence in these days. Hector Boetius—not the most credible of historians—relates that Malcolm Ceanmor held a Parliament at Forfar in 1061, at which he restored the estates that had been reft from the Thanes by Macbeth, and empowered them to adopt surnames from the localities where their lands lay. Amongst them was a certain "Gulielmus à Douglas," who was created first Lord of Douglas, and from him are derived the many and honourable men who have borne a similar title. Their influence throughout the struggles for Scottish Independence is very visible, and their growing power upon the Border ultimately induced a rivalry with the reigning family. He weighed both in one balance." But the story of the early adventures of the Douglas family belongs rather to the traditions of Douglas Castle than to Bothwell Castle, which is our present theme. The fortunes of the Douglases culminated in the person of Archibald, fourteenth Lord and fifth Earl, and with him they began to waver and decline. Through his active service in France he had won glory and wealth, and added several titles to those which he had inherited. His full style was—Earl of Douglas, Earl of Wigton, Lord of Bothwell, Galloway and Annandale, Duke of Touraine (in France), Lord of Longueville, and Marshal of France. But when James I. returned from his long imprisonment in England to assume the Crown of Scotland, he found some of the more prominent nobles too powerful to be tolerated, and suddenly cast many of them into prison, and the Earl of Douglas among them. So far as can be judged, the chief offence of that nobleman, besides his power, was a certain freedom of speech which he used in advising the King, which that monarch could not endure. Disappointed by this treatment, the Earl retired to France, and did not return till after the assassination of the King. He found Scotland in a most pitiable condition. The policy of James I. had taught him to elevate men of parts and understanding to places of trust in the kingdom despite their inferior birth; and for the slight thus passed on their nobility the upper grades of the Scottish nobles did not readily forgive him. When, therefore, the Earl of Douglas found that the government of his native land had been committed to Crichton and Livingstone of Callander—men of good family, but of low degree in the peerage—whilst he had been excluded from all share in the Councils of Scotland, he was not unnaturally moved with resentment. It was shrewdly suspected by the nobles that these men had been elevated to this high position as much for the purpose of curtailing the power of the nobility as for any special faculties they possessed; and the appointment of the Earl of Douglas to the post of Lieutenant-General of the Kingdom was too evidently an extorted concession to pacify them. The Earl by this time was too far advanced in years to meddle with paltry matters of dispute. He retired in 1438 to Restalrig, and died in that year. William, sixth Earl of Douglas, was only fourteen years old when he succeeded his father. He had inherited all the late Earl’s courage and daring, and as the oppressions of the Douglas family by the Stewart Kings was a frequent topic in Bothwell Castle, the young Earl was somewhat unguarded in his speech about them. Livingstone and Crichton became alarmed, and determined to have him removed. Crichton wrote to him a hypocritical letter regretting the discord betwixt the Earl and his kinsman, the King, and inviting him to meet James II. at Edinburgh Castle, and aid him with advice. The young Earl fell readily into the trap, and set out with his retainers for Edinburgh. Crichton met him on the way, and lured him to his Castle of Crichton, which he had just erected. For two days was the feasting and revelry maintained there, and then the followers of Douglas, with David, his younger brother, and his friend, Malcolm Fleming of Biggar, joined Crichton’s band, and all set forth for Edinburgh. Arrived at the Castle, Douglas was introduced to the King by Livingstone, and James felt, or affected, strong attachment to the two brothers, sole heirs of an ancient line. Several days were spent in entertaining them, and every mark of attention was bestowed upon them. By this double murder the direct line of the Douglases was terminated, and the title went to the grand-uncle, mentioned by the historian of the family as "James the Gross." His tenure of the title only lasted three years, when he was succeeded by his eldest son, William, whose character more resembled that of his uncle and cousin than of his weak and imbecile father. The plot of Crichton and Livingstone had been devised astutely so as to terminate the male direct line of successors, on the notion that the possessions of the Douglases would probably be distributed amongst heiresses, and thus wipe out the family. But their scheming was overturned to some extent by Earl William, who reunited the dissevered portions of the vast estates of his family by his marriage with Beatrix of Galloway, his first cousin, and chief heiress of the alienated lands of Douglas. By this union the Earl found himself in the position of the first subject of the realm. The intention of the Stewart Kings had been to centralize all power in their hands, and hitherto they had not scrupled to reduce the independence of the greater nobles by flagrant acts of injustice. Fate had selected James II. to be the chief instrument for the overthrow of the ancient house of Douglas. The story of the King’s consenting to the murder of the two young Douglases in November, 1448, has just been narrated; but the more disgraceful murder by the King’s own hand in February, 1451—2, when William, eighth Earl of Douglas, "was stabbed by King James II., and was despatched by some of his courtiers in Stirling Castle." The story is told in the account of "Stirling Castle" in this volume. With James, ninth Earl of Douglas, brother of the murdered Earl, the proud name of Douglas of Douglas was brought nearly to extinction. Earl James, wishing to avenge the murder of his brother, called out his retainers and also his three younger brothers, and made a demonstration against the King; but some of his allies deserted him, and when the King’s forces came out under George Douglas, Earl of Angus, in May 1455, James, the ninth Earl, was defeated at Arkinholme, and two of his brothers slain, and one made prisoner. In June of this year Parliament passed sentence of forfeiture on James, ninth Earl, and other members of the family. "Go thou and join the living dead! Vain hopes are nursed, wild wishes glow. To the Cloister hence away!" Had not a Douglas wrought his overthrow." The estates that had belonged to the Earl of Douglas, and were forfeited in 1455, at the time of his departure for England, fell to the Crown, and King James had taken the opportunity of partitioning these so as to secure some doubtful adherents. Crichton, the son of the Chancellor who had compassed the murders of the two Earls, received Bothwell Castle as the tardy reward of his father’s treachery; and Sir James Hamilton of Cadzow, who abandoned the cause of Douglas at this time, exchanged the lands of Kingswell for those of Bothwell Forest, whilst the lands of Galloway were annexed to the Crown.